Create the Fit Body you want for the Activities you Enjoy! Visit Lilly's New page on FaceBook, LillyHartsFitnessForever for helpful fitness tips and information. Feldenkrais Class April 7th and 8th, 2019. Presented by Madeleine Perrone, Guild Certified Teacher. Enhance coordination, balance and flexibility through a unique and gentle method while transforming the way you approach yoga, dance and everyday movements. Join us for the Feldenkrais Method Class and learn how to Move Young and Move Smarter! Limited class space, book your class or personal training session now! Contact Lilly to RSVP, book a private session, or ask questions. Click here for complete information. Create the Fit body you want for the activities you enjoy! 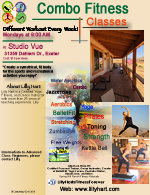 Professional instruction in the brand new Studio Vue with beautiful scenic views of the Mehrten Valley rolling hills. Elevate your fitness to the highest level in all areas, strength, flexibility, balance, coordination and aerobic capacity. BalletFitt is the Ultimate Group Exercise Class. A ballet-inspired workout that uses the principles of classical dance to tone and sculpt your entire body! Elevate your fitness to the highest level in all area, including strength, flexibility, balance, coordination, and aerobic capacity. No ballet experience is required! Click here for full details & Pricing. Have a splashing good time in the comfort of a heated pool, or escape the hot summer heat in a cool, refreshing aquatic environment while you get fit this Summer! All fitness levels welcome! Enjoy the full benefits of swimming and Poolside Pilates. 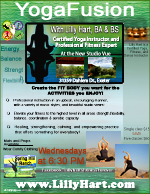 Work with expert dancer and yoga trainer, Lilly Hart. Her goal is to help her clients develop a fine tuned machine for their body, and to unite their mind, body and spirit . Lilly offers unmatched quality and variety of expertise. Allow your body to surrender to the health and joys of movement and creativity. Relax and rejuvenate in a safe and creative space with professional guided practice by Professional Dancer, Yoga and Fitness Instructor Lilly Hart. 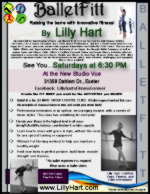 Contact Lilly today to find out more about her private instruction, Fitness Retreats, and More! Refresh your mind and body during one of our one day retreats, nestled in the breathtaking, scenic Mehrten Valley in Exeter, CA. We offer a wide variety of services in a very exclusive, and beautiful setting with breathtaking views. Best Yoga, Dance. and Fitness Retreats in Tulare County, Visalia, Exeter, Three Rivers and Surrounding Areas! Swimming • and much more! Click here for complete Calendar information. Contact Us Today to book a retreat. Click here to view complete Retreat Information. Don't wait! Pamper yourself with spa-quality amenities!